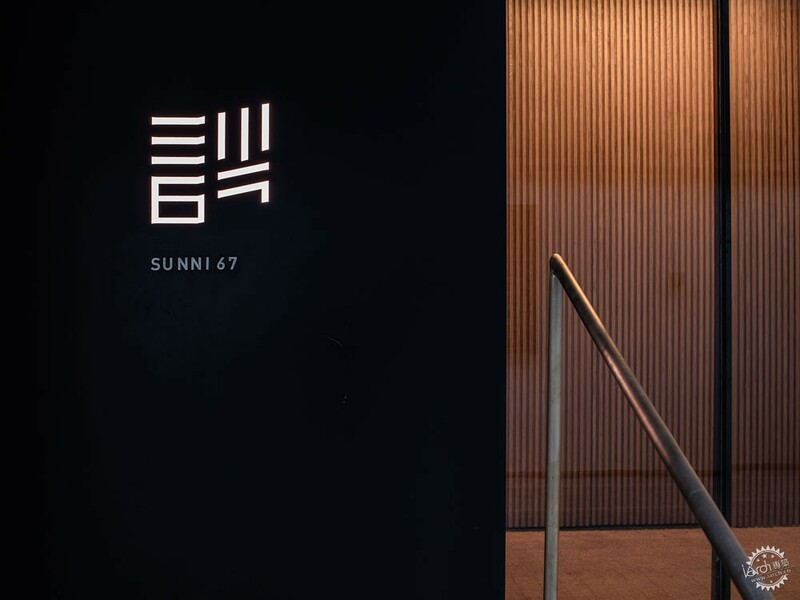 Located in the Xinyuanli district in Beijing, SUNNI 67 is a private kitchen featuring fresh ingredients and exquisite culinary skills. The idea of the design is to create a space about flavors that allows people to peacefully enjoy wonderful food from the bustling city. 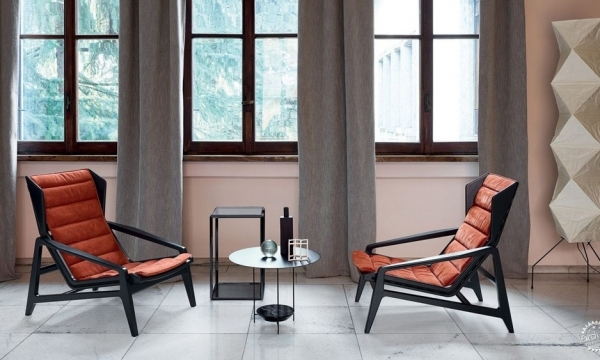 Inspired by In Praise of Shadows by Japanese writer Junichiro Tanizaki, the architect tries to explore the connection between taste and vision to create a space that is “melting dimly, dully back, deeper and deeper”[Junichiro Tanizaki, In Praise of Shadows, (Lette’s Books, 1991), 21]. 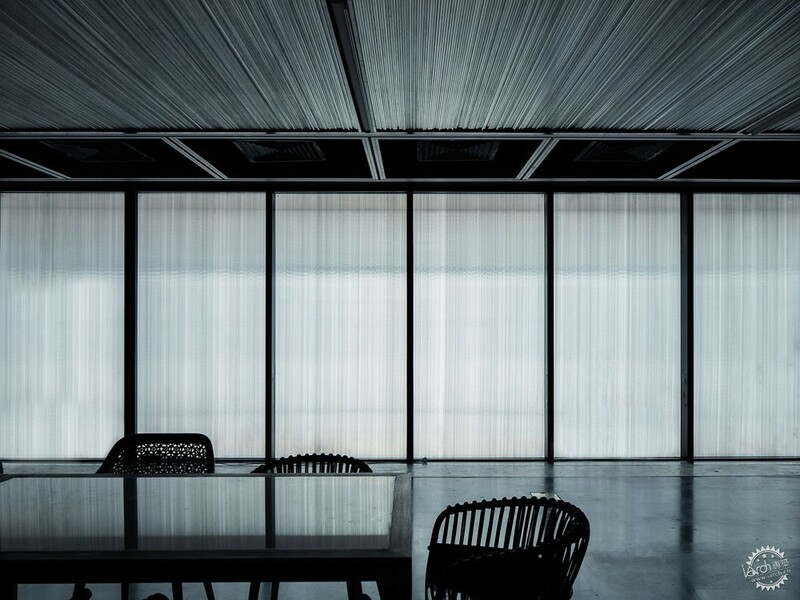 The light falling slowly from the ceiling was filtered and softened by the Polycarbonate panels. It is then gently blocked and defused by the white stone surface of the dinning table, making the upper part of the space with a gentle and homogeneoushue. The rest slices of light are absorbed by the dark shale when they touch the floor, which transits the lower part of the space into dimer tones. 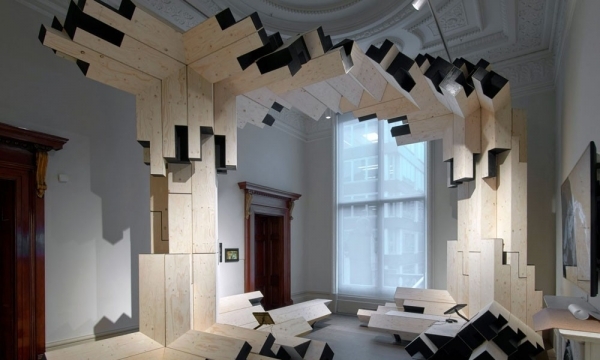 It not only whittles down people’s attention on the lower space, but also defines a blurring boundary in horizontal perspective, offering an infinite visual extension to the space. 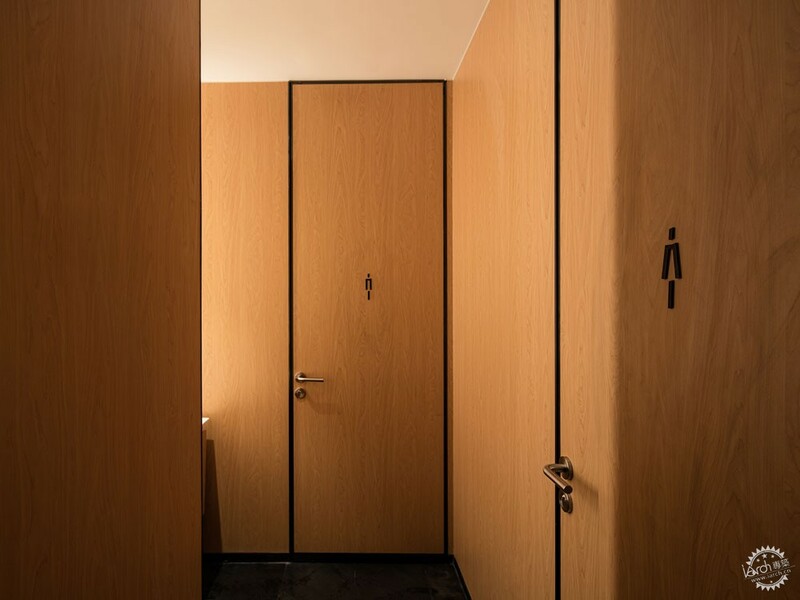 The wooden rails attached to the wall stopped the views from the outside, which adds more privacy to the interior and introduces measured natural light into the interior. The light keeps changning with the passing of time within a day, playing gently with the artificial illumination inside the space.The spotlights from the ceiling are projected on the desktop to intensify the dining area, food has thus become the leading role, adding a sense of solemn to the ritual of “eating”. The light of the whole restaurant is designed to be “dim and subtle” to create a sense of tranquility. 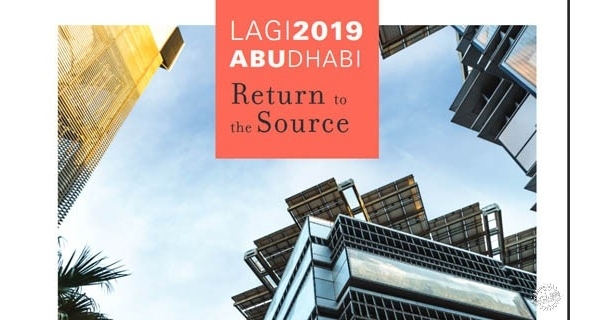 It is no longer an independent element of the space, but rather an immense medium reconciled by the interventions and interactions between different materials. The dishes and objects inside the space, aftering being attached with this medium, are somehow reduced from the excessiveness of their own brightness and became more gentle, demonstrating the architect’s pursuit of “restraint” in Eastern aesthetics. The lighting can be adjusted to satisfy the needs of different dining occasions, for example, lunch, afternoon tea, dinner, bar, and among many others. 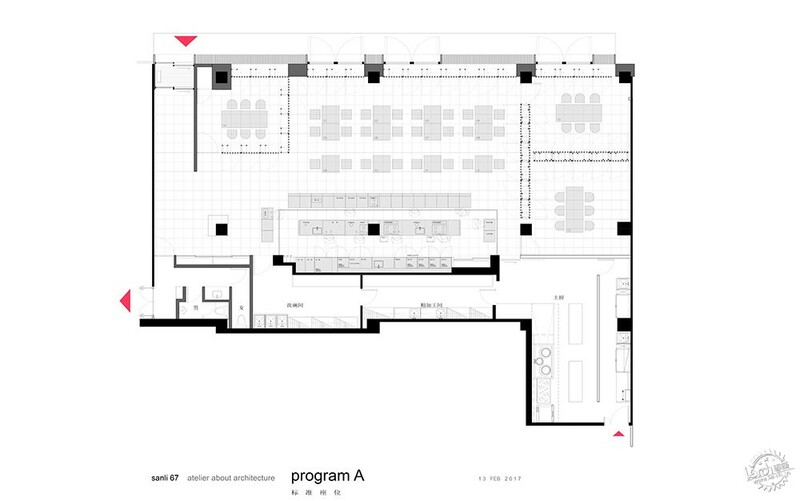 The restaurant is designed in free plan by opening all the basic spaces except the bearing walls. 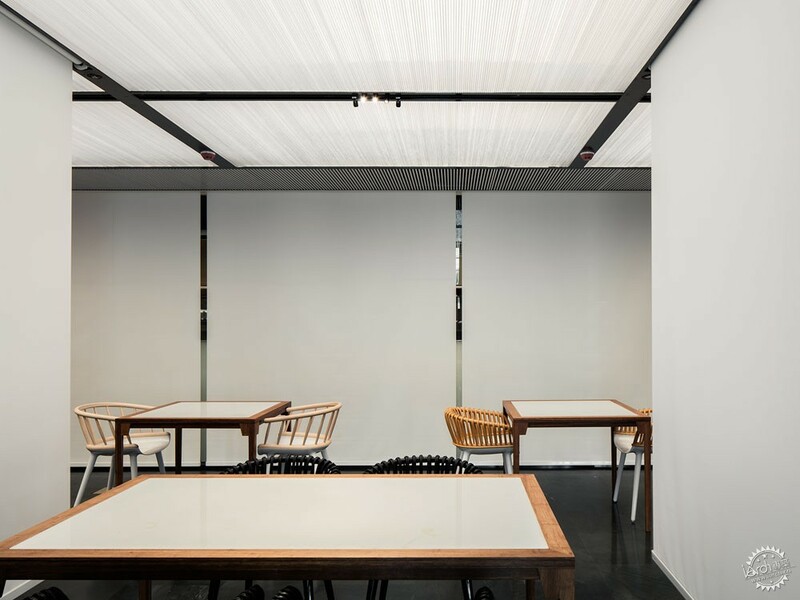 The space is partitioned by 1-metre-wide L-shaped wooden grille units which are custom made for the restaurant. 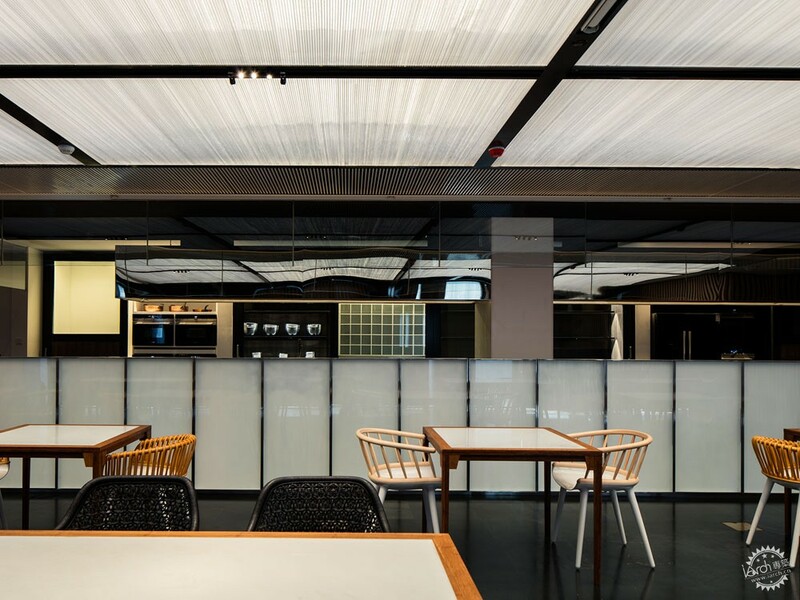 The grilles can move freely in both transverse and longitudinal directions by 1X1m, creating a flexible dining area together with the the moving of white fabric curtains. 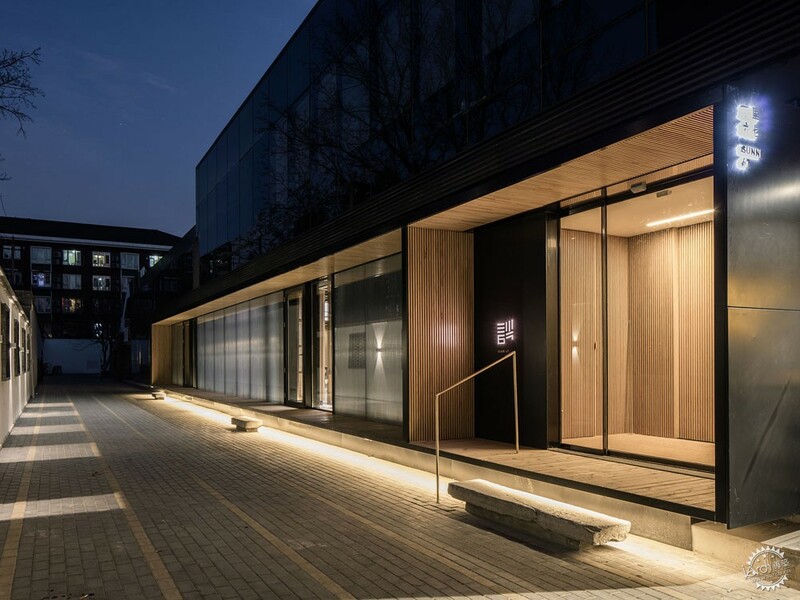 The space can be mainly transformed into 5 different types in accordance with the changes of moveable partition walls and people’s experiences. The free plan has greatly diversified the functions of the space and optimized its utilization. 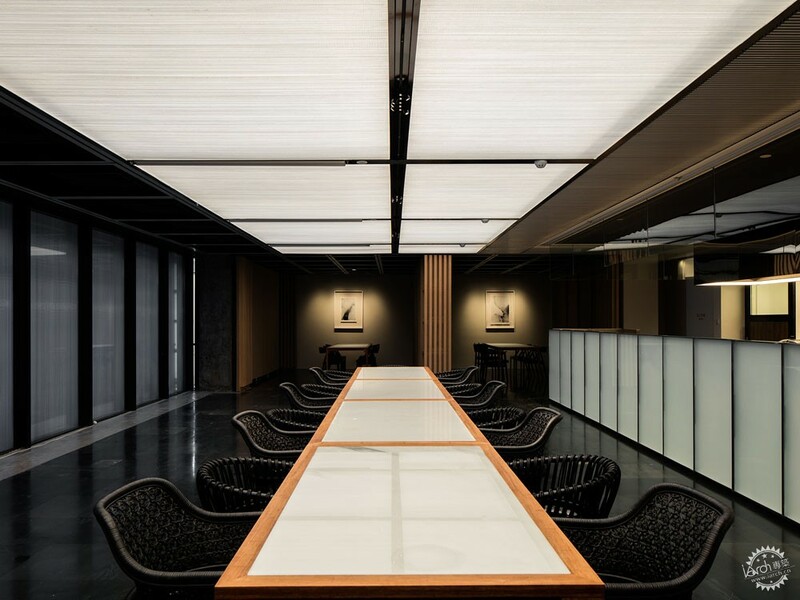 The architect tried to explore the commonalities among various materials in order to establish an inner connection, thus creating a peaceful and quiet dining atmosphere, such as the linear characteristics of Polycarbonate panels and wooden grilles, the glittering texture of the translucent Polycarbonate panels and the reflective quality of the white stones. 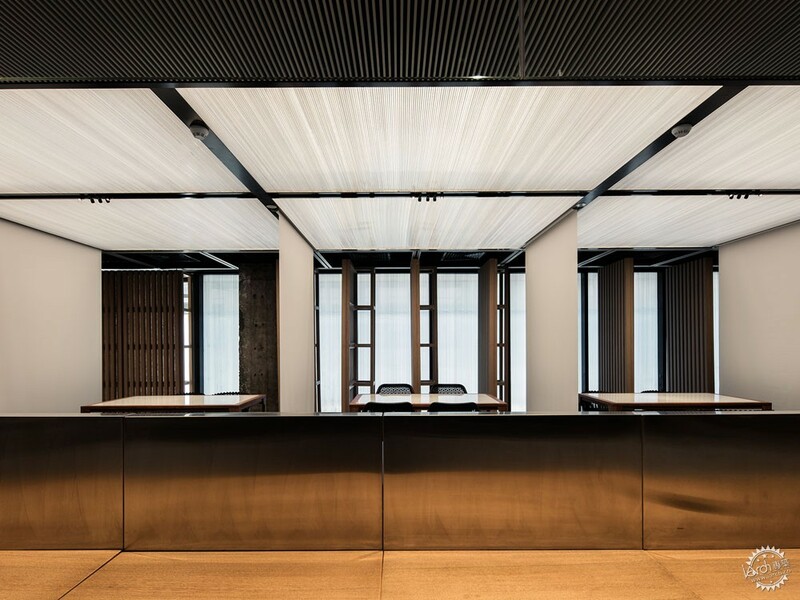 The architects also managed to introduce more handmade imprints into the products from mass-manufacturing machines, for example, the luminous ceiling and the exterior elevation were tightly spliced by 3000 Polycarbonate panel sectional slices, each panel was hand processed and the nuance reflects a strong flavor of craftsmanship. The kitchen in Chinese restaurants, usually recognized as dirty,noisy and lack of decency, has always been hidden in an obscure corner in the restaurant and remain invisible. However, the architect understands the cooking as the commencement of the ritual of “eating”, an indispensable part of the dining experience. 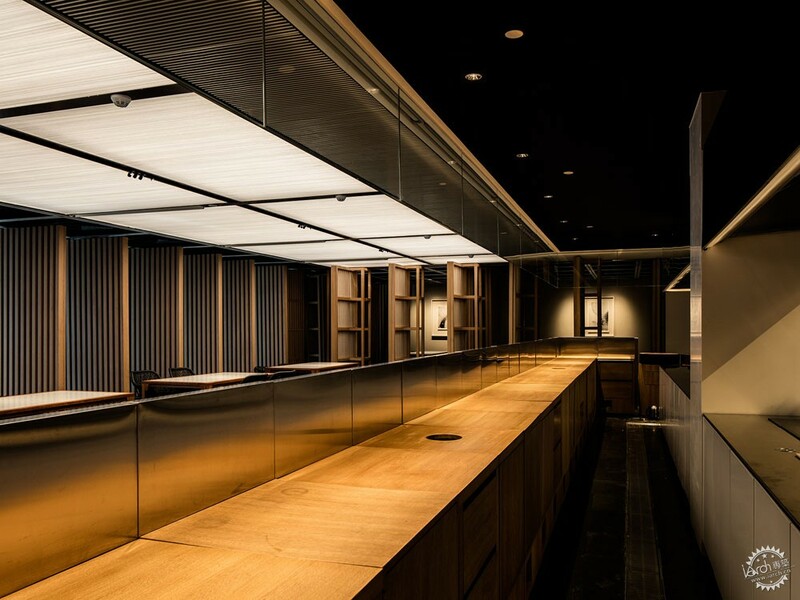 Therefore, the architect boldly adopted the idea of “stage” and opened the kitchen space in a confident manner to create more intimate connection between the food and the guest as well as to enhance the communication among different characters inside the restaurant. 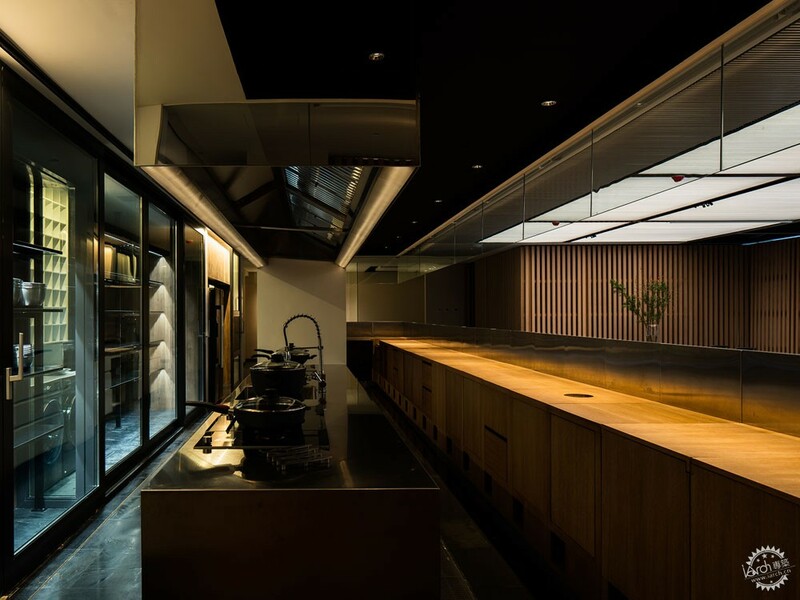 Behind the opening of kitchen in a Chinese restaurant, the architect tries to probe into the changing of a kitchen’s role in a space in Eastern context. Atelier About Architecture also designed the visual system of the restaurant, including Logo, fonts, prints, staff uniforms and tableware. 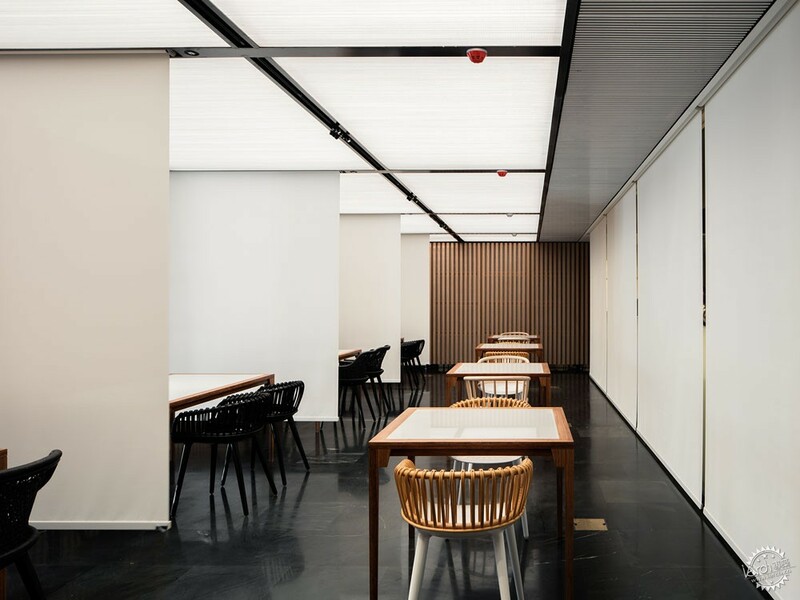 In a market today that favors retaurants of visual attractions, the architect chose to turn back to explore the originof the functional attributes of a dinining space. 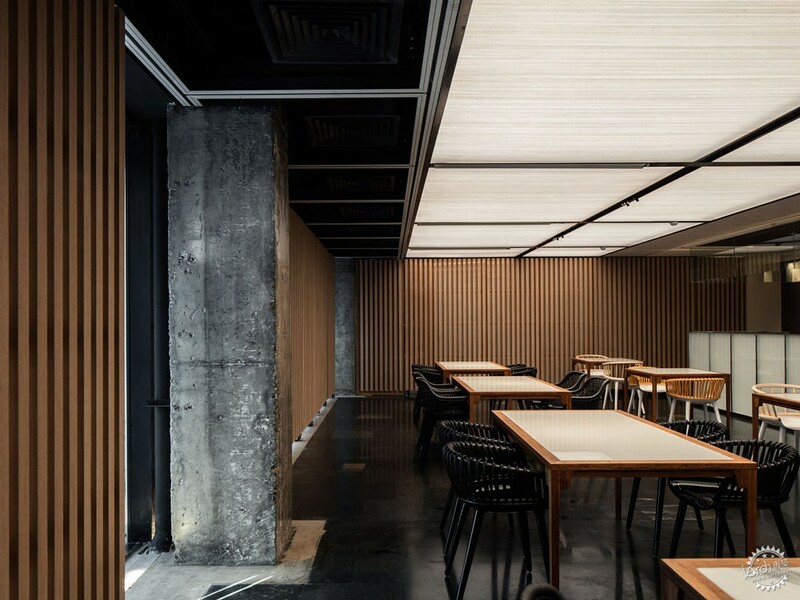 By playing with the lights, materials and changes of spaces, the architect created a poetic and implicit place that brings people’s attention back to food itself and the ritual of eating.